Google chrome by Google is one the most popular web browser these days. The popularity of this browser is due to its unique features which are numerous. One of the most noticeable feature in Google chrome is its extensions. This features allows you to add different kind of extensions which may be helpful while browsing or any other task you do. Google chrome provide best extensions, plugins and add ons for any type of user. In this article we have compiled a list of 16 Best Chrome Extensions For Web Developers and web designers. These extensions will be very helpful for developers and designers during their task. I hope you will find these extensions helpful. Please share your valuable comments. Share this collection to your friends. The BuiltWith Chrome Extension lets you find out what a website is built with by a simple click on the builtwith icon! BuiltWith is a web site profiler tool. Upon looking up a page, BuiltWith returns all the technologies it can find on the page. 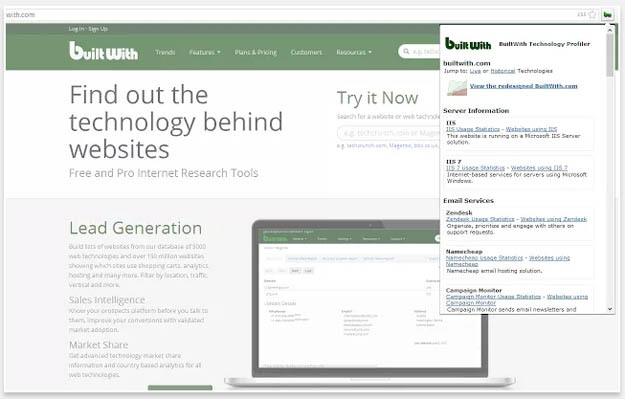 BuiltWith’s goal is to help developers, researchers and designers find out what technologies pages are using which may help them to decide what technologies to implement themselves. JSON Editor is a tool to view, edit, and format JSON. It shows your data in an editable treeview and in a code editor. It features view and edit JSON side by side in treeview and a code editor, Edit, add, move, remove, and duplicate fields and values, change type of values, sort arrays and objects, colorized values, color depends of the value type. Clear Cache lets you quickly clear your cache without any confirmation dialogs, pop-ups or other annoyances. Dimensions is a responsive web design testing tool. It is the easiest way to test responsive websites at different viewports. It works offline & is compatible with LiveReload. codev.it is the best designed online code-editor with built-in SQLite editor, Compiler, Time Tracker, Automatic Backup. Koding is an Online Development Environment including Code Editor, Cloud Hosting, Database Administration, and Collaboration with access to a Web-based file system and FTP & SVN integration. Kdigen is enriched with numerous number of features such as free developer accounts, lets you connect to your own FTP servers, shell access to your files and also online coding support for various languages such as php, peral, python and many more. Have Something To Add To This Article ? Please Share In Comments ! Thanks For Visiting !! !